Peeks Around 19 is my jewelry box. 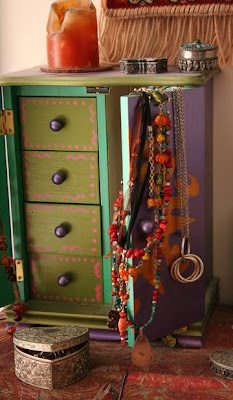 I've never found a jewelry box that really works. None of my necklaces fit on the necklace thing, so I hang them on the little door. Earrings are in a drawer and I couldn't even tell you without looking what's in the other 3 drawers. Clearly stuff I don't wear, probably because I don't know it's there. I'm the kind of person that needs to see things in front of me to keep them in the forefront of my mind. So much for the jewelry box. I remember when he was making you that dresser and you got it!